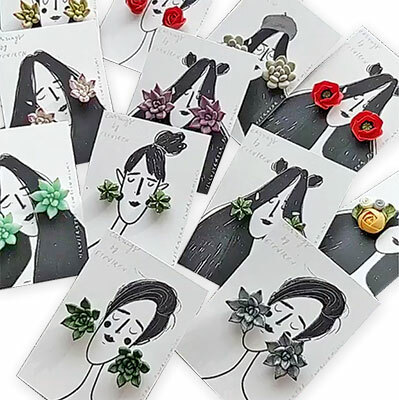 We rarely look at packaging and branding and such on PCD but Ukraine’s Iryna Chajka (eteniren) has gathered a gaggle of girls on cards to show off her stud earrings. 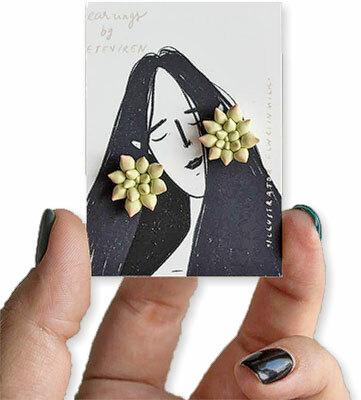 Iryna specializes in pale and delicate polymer succulents and flowers that show up particularly well against her girls’ hairstyles. The cards make the earrings much more dramatic. Smart marketing. Do you have a favorite? 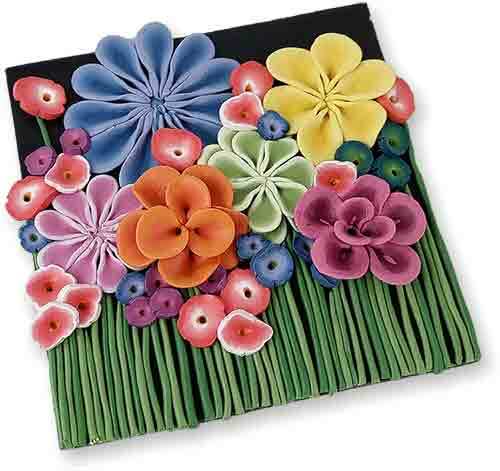 Ontario’s Karen Pasieka has gathered the blooms in her polymer garden into a bright bouquet on a 4×4 tile. See what varieties of flowers she has in her studio garden on Instagram. Her creation may remind you to run outside and admire summer’s bounty while you can. Karen has returned to her studio to get ready for the fall and holiday shows. It looks like lots of you got back to the studio this week. StudioMojo is full of links to new works as we try to wring every bit of summer creativity out of this month. We’d love to have you join our Saturday newsletter where we chat about all the fun stuff we couldn’t cram into PCD. 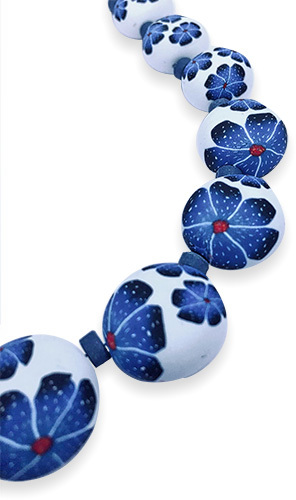 The UK’s Debby Wakely’s graduated round summer beads have a crisp summery feel. Look closely and you’ll see polka dotted petals and a dab of red at the center of each dark blue flower on the clean white background. Debby has only this one post on her Instagram (and the BritishPCGuild’s page) so she’s off to a good start! Earlier works show up on Facebook. Are you ready for tea and scones in the garden? California’s Meisha Barbee took Carol Simmons flower class when Carol came to San Diego in early April. You can spot Carol’s refined kaleidoscopic methods in a heartbeat. Meisha carried out the project in her own distinctive palette and with a quirky stripe here and a peppy dot there. 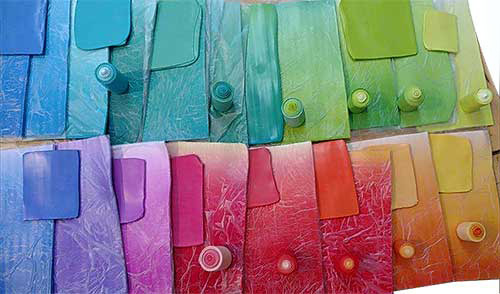 Her palette of colors mixed with Carol’s instructions look perfect on PCD on a colorful spring day. See Meisha’s interesting history on PCDaily. Texas’ Randee Ketzel shows off her submission for the Breast Cancer Resource Center’s annual gala. 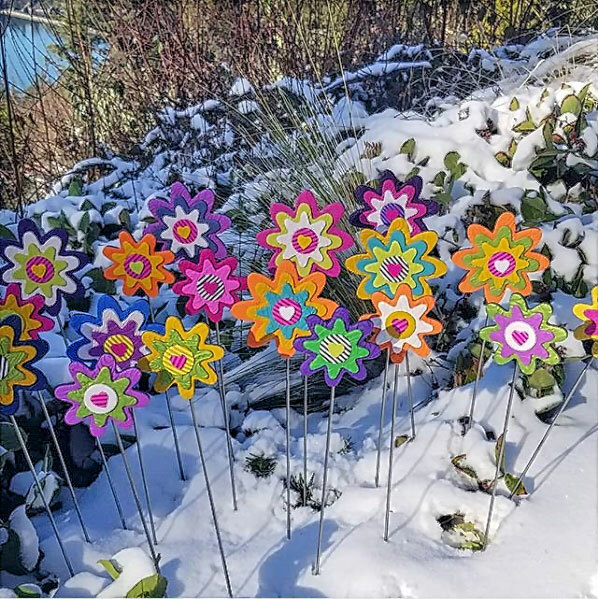 Randee made the flowers for Cancer, Don’t Bug Me in Carol Simmon’s class and added her own sculpted iridescent bugs. The creation will be modeled by Randee’s friend and cancer survivor Darla Breazle. While it’s not exactly beachwear, a project like this gives you an opportunity to stretch your imagination for a good cause. 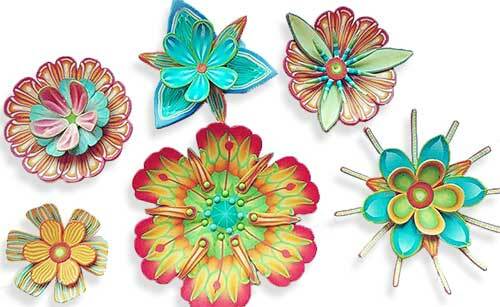 Join us as we cover more polymer finds and finery that will inspire you in this weekend’s edition of StudioMojo.